Fibonacci Introduced the Modern Numeral System to Europe - Fact or Myth? Leonardo Fibonacci introduced the Hindu–Arabic numeral system (the modern base 10 system with decimals and a zero) to Europe. Leonardo Fibonacci introduced the modern decimal numeral system (the Hindu–Arabic numeral system) to Europe in 1202. Before this Roman numerals were used. Unlike the Roman numeral system, Fibonacci’s place-value system uses a decimal place and zero (as a placeholder), and thus allows for more complex mathematics. Although it had been written about earlier by Monks and Scholars in the West, the Indian-Arabic numeral system (one of many ways to describe the system) wasn’t commonly used in the west before Fibonacci. Fibonacci called this system the “the Modus Indorum” or “method of the Indians” (the Brahmi and Hindu) and introduced it in his masterwork Liber Abaci (1202). Why is it Called the Indian-Arabic Numeral System? Fibonacci calls the Indian-Arabic numeral system “the method of the Indians” because the system originated in India. It was then brought to the middle-east by Muhammad ibn Musa al-Khwarizmi. Thus today we call it the Indian-Arabic system after the two cultures who developed the system before us. Fibonacci is a nickname: According to lore, Fibonacci is a shortening of the Latin “filius Bonacci” (or, son of Bonacci; like John-son is son of John, Fi-Bonacci is son of Bonacci; his father’s name was Guglielmo Bonaccio). He was also called Leonardo Pisano or Leonardo of Pisa (Pisa, an Italian Republic in which he lived). He also sometimes called himself Leonardo Bigollo, where Bigollo means traveller. So Leonardo, Son of Bonacci, the traveler, from the Republic of Pisa; or just Fibonacci. Why is the Modern Numeral System Important? Like al-Khwarizmi’s work revolutionized mathematics in the Golden Age of Islam, or like the Indian’s understanding of mathematics had revolutionized their culture before, Fibonacci’s Liber Abaci (the Book of Calculations) revolutionized Europe, especially regarding mathematics, science, banking, and trade. The Indian-Arabic (or Hindu-Arabic, or just Arabic in the west) numeral system’s use of zero (the place holder) and the decimal place allowed for much more complex mathematics than had previously been available in the Latin world. The Roman numeral system is a base-ten system (like the Indian-Arabic), but its lack of a zero only allows for only simple fractions; meanwhile the Indian-Arabic numeral system is much more efficient and allows for concepts such as complex fractions. Fibonacci’s insights were used in European mathematics starting in the late 12th – 13th century and entered common use from the 15th century when they fully replaced Roman numerals. FACT: Fibonacci was sometimes called the most brilliant mathematician of the Middle Ages, and his Liber Abaci which affords him this title. FACT: The terms algebra and algorithm are Arabic words. They both come from Latin forms of al-Khwarizmi’s name if that hints at his importance in the story as well. TIP: The Medieval number system used different symbols for 4, 5, and 7. In Brahmi their 6 and 7 closely resemble ours, in Hindu the 0, 2, and 3 do, in Arabic the 1 and 0 do, and in Roman Numerals the 1 does (the 1 looks like one finger, so it’s a common symbol for 1; the Roman Numerals, especially 1 – 5 are based on fingers). Learn more and see what they look like here. TIP: The “Indian system” refers to the Brahmi and Hindu systems (the Hindu uses a zero, the Brahmi doesn’t.” Meanwhile, the “Arabic system” refers to middle-eastern systems like the Arabic and Persian (which are both Western terms). TIP: The nine Brahmi mathematic figures are symbols that can be translated to modern numbers as 9 8 7 6 5 4 3 2 1. The Brahmi used a blank space for a 0, while the Hindu and Arabic systems use a 0, which the Arabic culture called Zephyr. With these nine figures, a decimal place, and with the sign 0 (the placeholder), any number whatsoever can be written. Why did some early systems not use a zero? A zero isn’t a number, its a placeholder. A person either has 1 or more “things,” or they don’t. Thus early systems were geared toward representing “things,” not concepts like zero. Consider, Ten is 1 group of ten and this is denoted by a place holder (zero) in the one column. The Fibonacci Sequence: Nature’s Code. Did Fibonacci Invent the Modern Decimal Base-10 Numeral System? Fibonacci didn’t invent the systems, he just combined ideas and defined them for a new audience. Versions of the modern numeral system come from Egypt and Babylon, as do base-10 (although other bases were used, humans have ten fingers, and thus base-10 is old and common). Base-10, along with Decimals and zeros, were also used in China and India long before 1200. The Romans had used Roman Numerals, and thus the Italians and Europeans continued that tradition until Fibonacci imported and popularized the new system in the west. Liber Abaci encompasses a wide range of knowledge of previous discoveries including those of Pythagoras, Euclid, and Diophantus, together with the algorithmic methods derived from Arab sources, such as Muhammad ibn Musa al-Khwarizmi, and others as noted above. The modern numeral system is commonly referred to as “Arabic” by the Europeans, and the Indian numeral system in the middle east. It’s named after the culture it was learned from in both cases. The world’s earliest positional decimal system was the Chinese rod calculus. History of Mathematics: Who Invented Decimals?. What is Liber Abaci About? Fibonacci’s Liber Abaci (the Book of Calculations) includes some interesting concepts. He explains how to use Zero and decimal places, how to deal with weighing coins and converting weights, and how to divide Pisa’s money into pieces, which involves separating the Italian Pisan currency “the bezant” using decimals. Read: Here is a brief introduction to Liber Abaci (the Book of Calculations) translated into modern English: “FIBONACCI’S LIBER ABACI”: A TRANSLATION INTO MODERN ENGLISH OF LEONARDO PISANO’S BOOK OF CALCULATION, BY L.E. SIGLER. Arthur Benjamin: The magic of Fibonacci numbers. 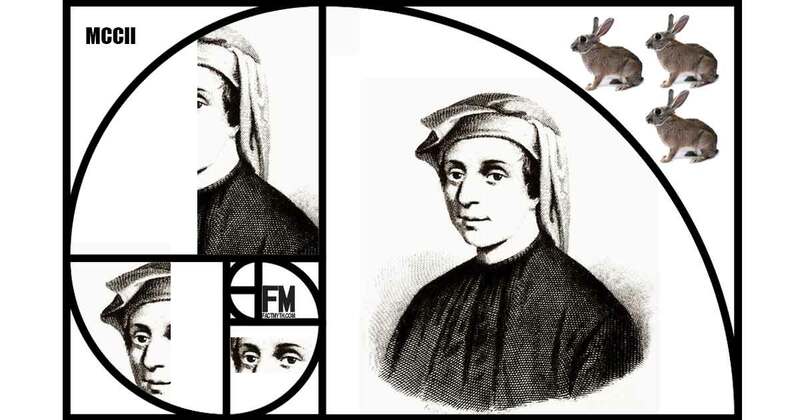 Fibonacci’s rabbit example is a classic example of complex math that can be done with the Arabic numeral system. Below is a snippet from a section from the book liberated from math.utah.edu. The general mathematical solution for the rabbit population is a series with terms 1, 1, 2, 3, 5, 8, 11, …, expressed by the initial conditions F(0) = 0 and F(1) = 1, with the recursion F(n) = F(n-1) + F(n-2). (Meaning add the two previous numbers to get the next one). The total number of rabbit pairs after the births at the start of month n is F(n+1). The answer to Fibonacci’s question is the count at the start of year 2, F(14) = 377. At the start of year 3, F(26) = 121,393. At the start of year 4, F(38) = 39,088,169. At the start of year 5, F(50) = 12,586,269,025. Why Are Fibonacci Numbers Important in Nature? : Math Problems & Trigonometry. The rabbit example in video form. Note: Fibonacci Numbers are closely related to Fractals (which also use recursion), they are mathematic representations of infinities found in nature. Gods Fingerprint→ The Fibonacci Sequence – Golden Ratio and The Fractal Nature of Reality. Fibonacci opened the door to theoretical metaphysical mathematics, and the world has since jumped through often. This is just such a video. One might assume concepts like decimal places, zero, and the symbols 1 2 3 4 5 6 7 8 9 had been around forever, but they weren’t used in the west until Fibonacci brought together the world’s maths in his Book of Calculations.